The guide is for newly appointed managers, or staff who are about to be promoted to a management role. It includes information about how to smoothly transition to a management role. 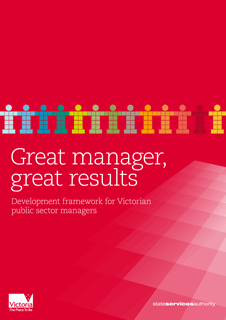 It includes a discussion of public sector expectations and standards, real life examples, self-assessment activities, and pointers to other resources that can help new managers. Welcome to Management can be used as part of a manager’s induction, or as a refresher or reference for ideas to help deal with management challenges that may arise in a workplace. The guide does not cover financial management, project management or general public administration requirements.